We are hiring! Click here to apply online or Click here for a printable application. We had a surprise from our supplier this week and did not receive the catfish we ordered. We apologize for running out and not posting a notice earlier. Easter is Sunday 4/21. 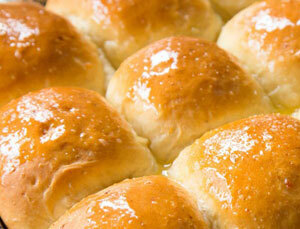 Pre-order your family's favorite fresh baked dinner rolls now! 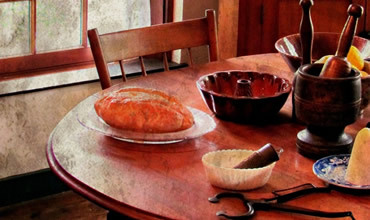 Order online or see our bakery department staff today! We will have shortened holiday hours on Easter Sunday 4/21/19 so that our employees may spend the time with their families. We will be open 7 am - 2 pm. Please plan accordingly, and thank you for shopping at Christopher's! Requires 3 days (72 hours) notice. 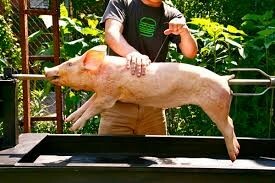 See our meat dept. staff for more info or to place your order. Visit our Deli & Prepared Foods Depts. for all you platter needs! Specialty Cake creations from our Bakery Dept. Make it a movie night. Stop by our RedBox today! A great locally roasted coffee. A great locally made sauce! Pick up a jar today. While many stores are moving to prepackaged meats, we still cut our meats fresh every day. So if you are looking for a fresher product stop by the Christopher's Fine Foods meat department today. The Christopher's Fine Foods Meat Department has everything you need. Courtney works hard and is a valued member of the Christopher's family. She helps out in multiple areas of store operations, and can always be counted on to go the extra mile. Jenny Malley, Prepared Foods Dept. The menu will be posted shortly. Please check back. Openings for part-time Cashiers. Additional openings in our Deli & Prepared Foods departments. In accordance with FLSA, DLLR, OSHA, state regulations about minor work permits for persons under 18 years of age, and age requirements to operate certain equipment, all applicants must be 18 years of age or older. By popular demand we now carry Krispy Kreme Donuts. Delivered fresh to our store for you. Stop in today and pick up your favorite. They're just so good! "The BEST chicken necks AND filet mignon!! Only at Christopher's. This is the best steak I have had in as long as I can remember!" 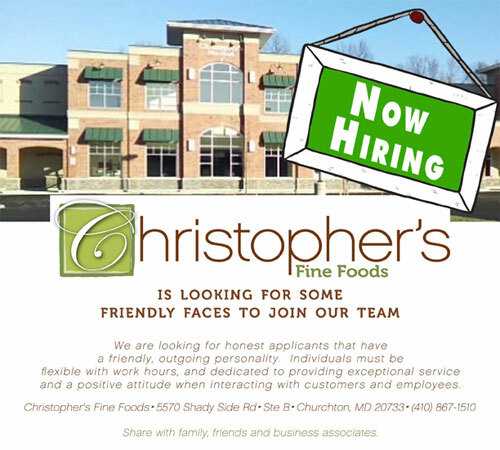 Christopher's Fine Foods is a grocery store that serves the southern Anne Arundel county area surrounding Churchton, Deale, and Shady Side Maryland, along with the neighboring communities. We are a local and veteran owned business. Looking for a job? We are looking for some good people. Fill out our printable job application. We would love to hear from you! Copyright © 2011 - 2019 Christopher's Fine Foods. All Rights Reserved.